This is a guest article from Gord Sheppard. I could go on, but I can feel your meeting pain shooting through your eyeballs as you read this. I think we can agree that you can’t afford unproductive meetings. Why? Well, they cost too much money, waste valuable time and frustrate your staff (which could make them quit). Too much bad meeting behaviour affects your ability to serve you customers at a high level, and ultimately will cost you a lot of money. But don’t despair! 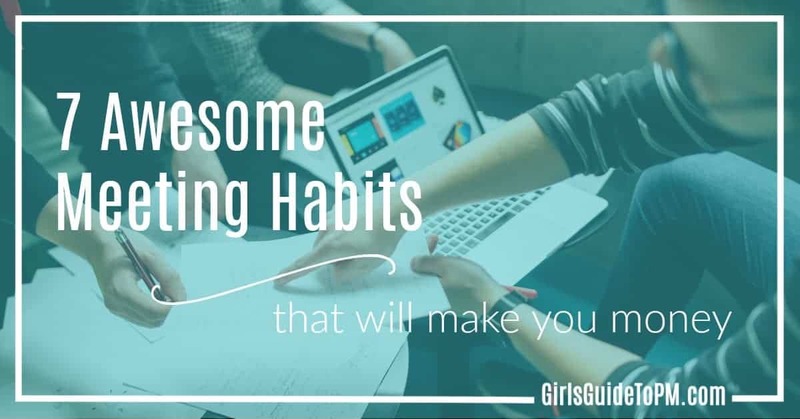 Here are 7 Awesome Meeting Habits That Will Make You Money, based on my experience in running and attending more than 2000 meetings. At the end of the meeting, you can re-state the objective then and ask “Did this meeting move our strategic objective forward?” If the answer is yes, then it was a great meeting. If the answer is no, then you’ve got some work to do to make your next meeting more profitable. To ask less of the planet, we ask more of ourselves. If the answer was yes, then it was a profitable meeting that moved this Key Strategic Objective forward. If the answer was no, then that meeting team should have started to make adjustments to ensure that this key concept was reflected in their next product development meeting. Determine your total meeting cost. #1: A company with 25,000 employees in which each employee attends 100 meetings per year (2 meetings per week) at an estimated cost of $500 per meeting. #2: A medium sized business with 1000 employees in which each employee attends 50 meetings per year (1 meeting per week) at an estimated cost of $250 per meeting. Can your organisation afford to spend this much on meetings? Now. Estimate what you would like your MROI to be (meeting-return-on-investment). Cut out any meetings that are not giving you a positive MROI. Then create a bonus program that encourages teams to continue to have more profitable meetings. Would you be late for a meeting with your best customer? No. So if you want your meetings to make you more money overall, then treat each person in the meeting like they were your best customer. So if people are coming in late for meetings, here’s a suggestion. If your meeting starts at 9AM, then lock the door at 9AM and don’t let the latecomers in. I learned this technique when I interviewed Larry Schwenneker in episode 8 of the Create Awesome Meetings Podcast. Larry was a Senior Leader in charge of a 500 million dollar portfolio, and his time, like yours, was precious. So, when he chaired a meeting he would lock the door at the appointed meeting start time, and anybody who was late wasn’t allowed in. One time, his boss was late and stood outside the room pounding on the door to be let in. And guess what happened? Larry didn’t let him in. Guess how often this happened? Once. Because after that, Larry’s boss would show up on time for meetings. And while it was fun to hear about how much trouble Larry got into for doing this, I also found out that Larry’s boss adopted this technique and started locking the door at his own meetings, to make sure that everyone was respectful of each other’s time. How much more money would you make if every meeting in your organisation started on time? Don’t follow up after meetings resulting in no accountability for anyone. So if this bad meeting leader is wasting your team’s time, how is that helping your customers? If they refuse to get training then you should remove the bad meeting facilitator from the meeting forever. This will allow that team to rebuild and move on, and give their meetings an opportunity to become more productive. One of the best ways to respectfully keep people on track during a meeting is to set up a ‘parking lot’ for unrelated discussions. This is a place on the whiteboard or on the agenda itself where you can record good ideas (that are unrelated to the current meeting) so you can revisit them later. When a facilitator does this with confidence, then not only does that person know that they have been heard and that their new idea will eventually be discussed, but everybody else in the meeting will feel that their time is being well used. With the pace of change these days, status-quo meetings will lose you money. I have to admit that when I worked in the corporate world I often ‘mailed-it-in’ during useless weekly staff meetings. You know the type of meeting that I’m talking about, where it’s all about updates and people talking about what they did on the weekend, instead of actually making decisions that move the company forward and ultimately serve your customers. So, to avoid status quo meetings, the facilitator should occasionally interject and say, “Can anyone disagree with or improve what we just talked about? 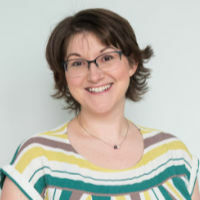 Because if we can’t, why did this item get onto the agenda in the first place?” This will set a tone of high trust for the meeting and allow people to openly share their best insights. We don’t interrupt when the customer is talking, so why do we interrupt each other? I don’t look at my cell phone when I’m with a customer, so why do I look at it during a meeting? I follow up fast after every customer meeting, so why do I not follow up effectively after our meetings? I have all the information my customers need when I speak with them, so why did I come to this team meeting unprepared? I’m never late for a customer meeting, so why was I late for this meeting? Now that you know what to do, your biggest challenge is implementation. To help you get the ball rolling here are few reasons that have inspired other teams to improve their meeting culture. Are you ready to put at least one of these habits into action to turn your meetings into a competitive advantage? 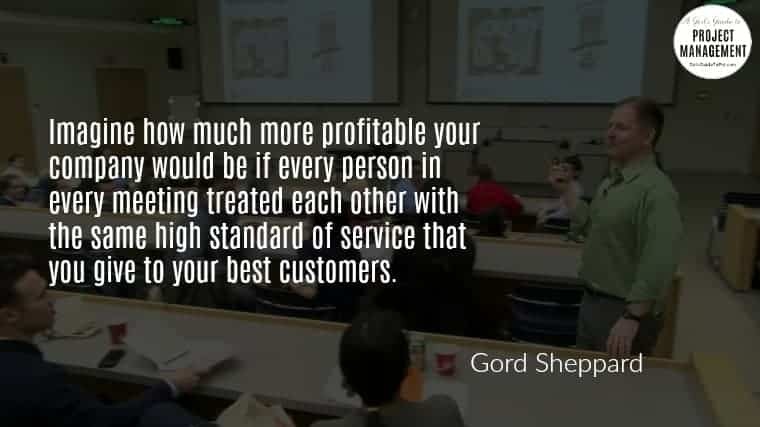 Do you want to serve your customers at a higher level? Do you want your company to make more money? About the author: During his 25 years of work experience, Gord has facilitated, run and participated in more than 2000 meetings! 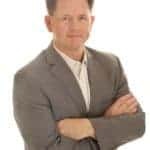 He is a Professional Speaker, Meeting Facilitator, Consultant and Trainer who combines a Master’s Degree in Business Administration with a Bachelor’s Degree in Drama, and Prosci Change Management Certification, to deliver a unique, people-centred approach that will help you make your next meeting more productive and profitable. 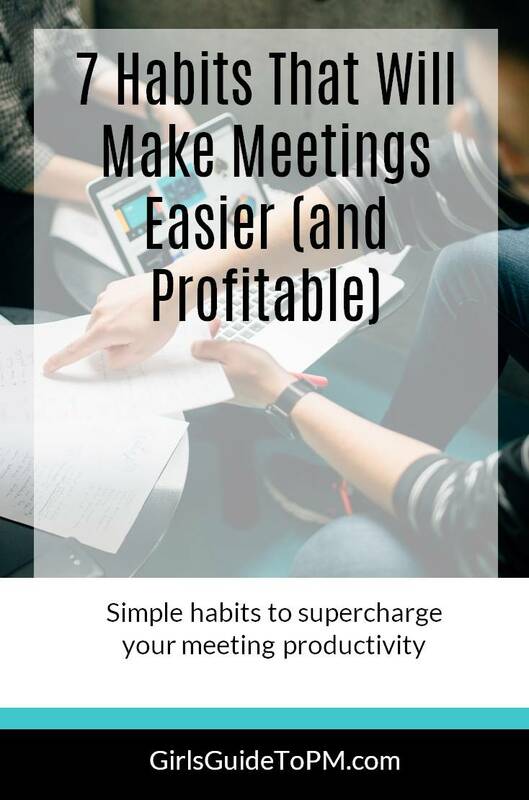 Gord is the Author of How To Create Awesome Meetings which offers a proven 10-step system that will help you take action and turn your meetings into a competitive advantage. 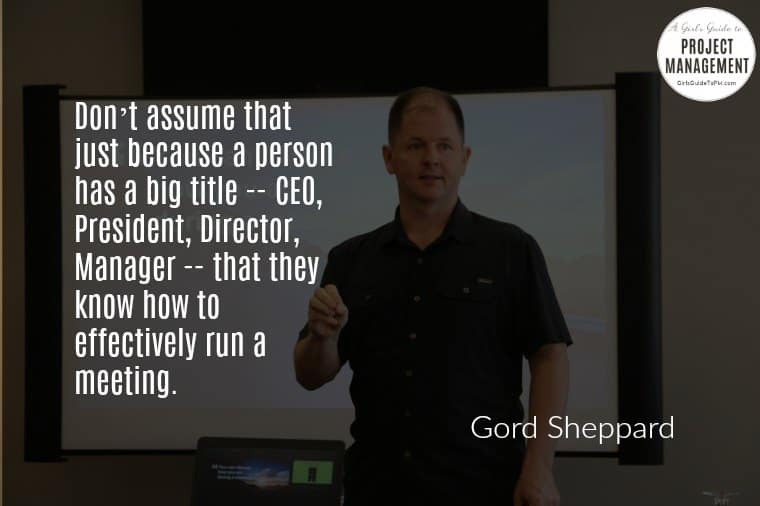 If you’d like to learn more about how Gord is changing the world, one meeting at a time, then get in touch at gord@createawesomemeetings.com, or visit www.createawesomemeetings.com. Many thanks to Gord for letting me republish this article from his website. Filed Under: Skills Tagged With: meetings, This article contains affiliate links.